We accept payment via PayPal, Mastercard or Visa. All credit or debit card payments are secured by PayPal. Charging a flat rate of postage helps make our systems more efficient so we can get your orders to you faster. We send most of our orders within Australia with either Regular Parcel Post or Express Post (your choice) to ensure swift, trackable delivery. Depending on the size of your order, it will cost from $7.95 upwards plus packaging and our time, so a $11.00 fee for Regular Parcel Post and a $14.30 fee for Express Post is a compromise that ensures we cover most of our costs (satchel, postage + time), while keeping it fair for you. Some of our smaller, lightweight items can be shipped as a large letter (instead of a parcel) when ordered on their own, eg Cintas Hairbands and Greeper Laces. Depending on how many of these you order, you may have the option of a special Priority Post rate of $4.40 inc GST (unfortunately, there is no tracking on this). We're really sorry, but we're unable to ship internationally right now. Hopefully we'll be back on board soon! If you would like to place an order, please email us for further information. When we are back on board with international sales, we ship internationally by weight (calculated at check out). Unfortunately, international shipping from Australia is quite expensive. When we get to the post office, if we find that the shipping comes in at significantly less that what you've been charged, we will refund you the difference. Due to the cost of international shipping, it is difficult for us to process exchanges from overseas if you choose the wrong size (shipping will be at the customer's expense) so please come to us first with any questions about sizing before you order. I just want to try one pair of socks or undies first - can I get a sample? after placing your order, you will receive an automated invoice via email, which will include a coupon code enabling free shipping within Australia once per customer. This means if you come back for more, you won't be charged freight as long as you remember to use the coupon code next time you order (unfortunately the discount can't be applied retrospectively). If you don't receive this invoice, please check your junk mail. If you order multiple of the same item but, after trying the first one, you realise it's not a good fit, we are happy to exchange (or, in some circumstances, refund) items that are unworn and still in their original packaging. We ask you to email us first and, if we give you the all clear to return the unworn items for exchange, we ask you to enclose a pre-paid Australia Post satchel so we can send the new goods to you. Please refer to our terms & conditions for more information. The SmartKnitKIDS socks are not actually sold as ankle, crew and knee height - this is just a guide to where the socks will sit, depending on your child's shoe size and the sock size chosen. Keep in mind that the socks have no shaped heel, so the sizing is very flexible - multiple sizes may suit your child, but the tightness of the fit and the length on the leg will vary. As you progress through the SmartKnitKIDS sizes, the socks increase slightly in width and length. 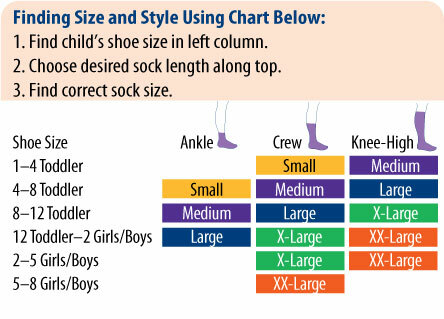 To use the SmartKnitKIDS sizing chart, refer to your child's shoe size first on the left hand side. Follow this row across to the column that matches the leg height you want and this will indicate the recommended sock size. When choosing the size during the ordering process, we also provide the length of the sock in centimetres from top to toe (remembering there is no heel). You can measure from the tip of your child's big toe, along the top of the foot and up the leg to where you want the sock to sit, then use the measurements as a guide. There is quite a bit of stretch in the socks and they can also be folded or pushed down. If you're still not sure, please contact us. What do you mean by seamless? Why is there still a line near the sock toe? SmartKnit socks are manufactured differently from other socks, in that they are knitted like a cocoon, starting from the toe and working up from there. There is no sewing at all - they are completely knit by the knitting machines. The needle bed does change during the process, so at times you may still see a line (closure) near the toe on one side, but no bothersome, bulky seam is present. Some super sensitive kids may still question the appearance of the line - please encourage them to persist and give the socks a go. They will notice a big difference from regular socks. The size or colour I want is not in stock - when will it be available? This will depend on the brand. It is best to contact us and we can let you know. Can I place a special order for a size or product that you don't normally stock?